Facebook, with more than 1.8 billion monthly active users, remains the world’s most popular social network, by far. If the social media giant were a country, it would be much bigger than China. But although it's in several major markets – including China – and a few medium-sized and smaller ones too, Facebook doesn’t dominate the social landscape. Social media strategist Vincenzo Cosenza has been charting the most popular social networks by country since 2009. His January 2017 World Map of Social Networks, based on traffic data from Alexa and SimilarWeb, reveals that Facebook is still the leader in 119 out of 149 countries analysed. 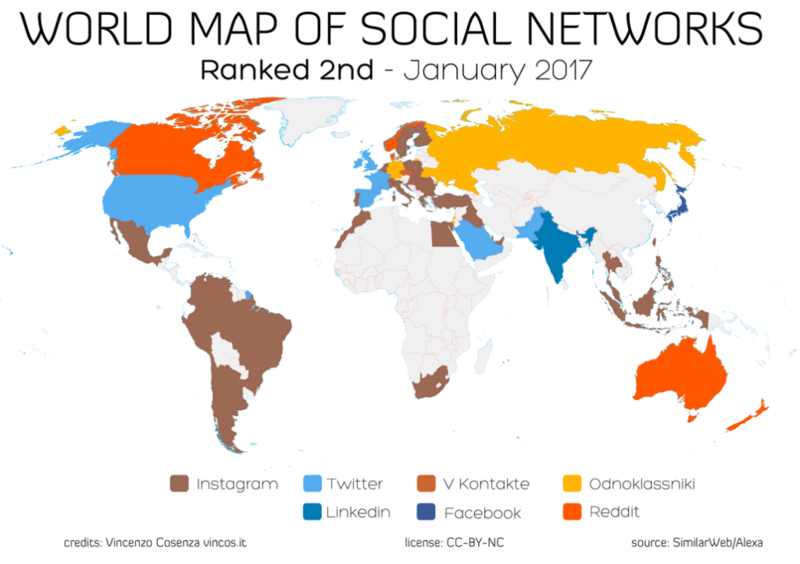 By comparison, Consenza’s January 2016 map showed Facebook as the No 1 social network in 129 out of 137 countries. This drop can be attributed to a number of trends. Since early 2016, LinkedIn has moved into pole position in several African countries, while Facebook-owned Instagram is now the most popular social network in countries including Botswana, Mozambique, Namibia, Iran and Indonesia. Is your social angst affecting the world economy? Meanwhile, VKontakte (known as VK) and Odnoklassniki (OK.ru), which are both controlled by Russia’s Mail.ru group, have also gained ground, according to Cosenza. In China, where Facebook, Twitter and Instagram are blocked in most areas, QZone is the top social network, with 632 million active users. QQ and WeChat, China’s favourite messaging apps, have even more users than QZone, as shown in the chart below by Statista. Japan, according to Cosenza, is the only country where Twitter is the most popular platform. 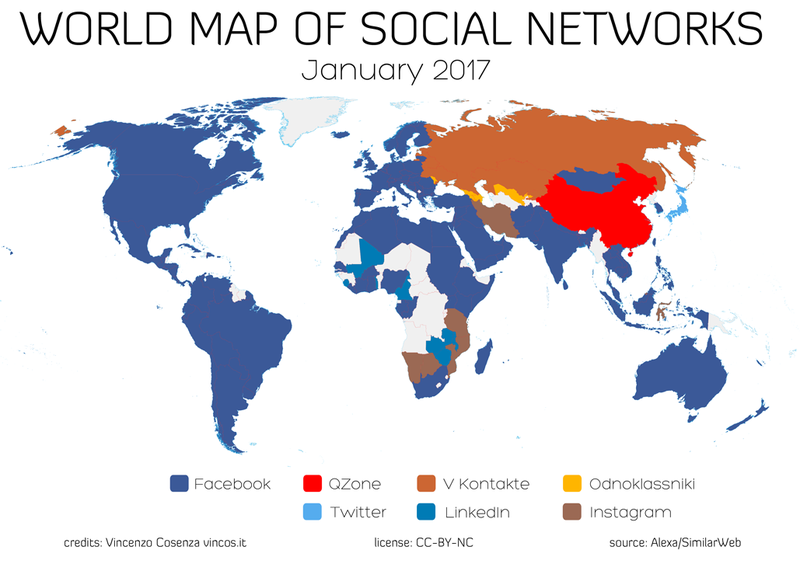 When Cosenza crunched the numbers for the second-ranked social networks in 57 countries, there was almost no Facebook blue left on the map, with the exception of Japan. Instagram, which has 600 million monthly active users, was the runner up in 37 countries, and Twitter second in the US and most of Western Europe. The second choice for Indians was LinkedIn. Since January 2016, Instagram has dropped from second place in Australia, Canada, Denmark, New Zealand and the United States. At the same time, Reddit took the No 2 position in Australia, Canada, Denmark, New Zealand and Norway.